Home/Builder, General Carpentry, Uncategorized/Meet the team… Who are we? When choosing a builder, you want to know the person or people who are going to be in and around your home. You want to be able to trust them and you want to know they have the experience and knowledge to complete the works. So today, we’re giving you a little insight in to who WE are and who is in our team. Who are the team behind Top Shelf Building and Carpentry (TSBC)? All Craig has ever known is building! Craig’s passion for all things timber and building started from a very young age and has continued ever since. He completed his carpentry apprenticeship back in the 1990s (WOW!) and then furthered his studies to become a Registered Builder. 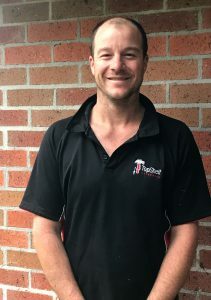 Craig enjoys all aspects of building from deckings & pergolas to renovations and extensions and even window installations. No job is too big or too small for Craig! He enjoys completing a job; seeing the end product and leaving knowing that the customer is happy. On-site, you will quite often hear Craig and Jayden laughing and having a good joke with each other. The best type of team is a happy team! In his spare time, Craig enjoys playing basketball and camping, spending time with his two sons and is a member of the local CFA. 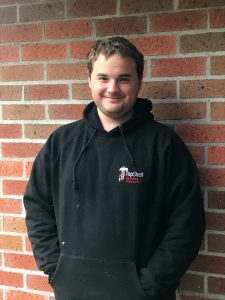 Jayden started at TSBC at the start of 2015 as a VCAL student and we’re pleased to say he has never left! In 2016, we officially employed Jayden as a 1st year carpentry apprentice. Jayden has been a wonderful addition to the team and is enjoying learning all different aspects of carpentry. He enjoys all aspects of building but what he enjoys the most is, is seeing the client’s happy face when the job is complete. At TSBC, we are so proud of Jayden. He has completed approximately 98% of his 4 year apprenticeship theory aspect in just 2.5 years. Jayden does much prefer to be on-site rather than stuck in the books. When Jayden isn’t at work, he enjoys being a part of his local CFA and spending time with his friends. 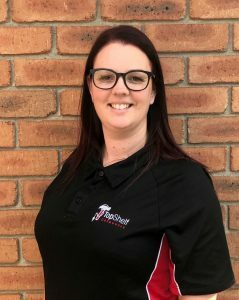 Liv is ou r go-to person for all things paper, scheduling and organisation and has been an administrator for over 17 years. She has worked in various fields such as health & fitness, plumbing, hospital and medical and of course construction. She has a passion for planning and ensuring that all documentation and scheduling of jobs is on track. Liv enjoys all aspects of her role at Top Shelf Building & Carpentry (except the part where the boys drive her crazy!) but her favourite part would be website development and business branding. Thanks for stopping by today and getting to know our team! We look forward to meeting you very soon.